After a four-year hiatus to regroup and determine the future of the franchise, Disney and what was once its surprise mega-hit “Pirates of the Caribbean” series have returned in “On Stranger Tides.” Hard to believe that this franchise evolved from the once-lambasted concept of a theme park ride being turned into a successful motion-picture blockbuster. After exhausting the “Pirates” world with two back-to-back sequels of titanic and rather disappointing proportion in 2006 and 2007, a break in the action to recalibrate Captain Jack Sparrow’s compass was much-needed. The “new” course set by “On Stranger Tides” uses worn sails, but with a fresh wind of characters and more importantly, a more direct purpose. As promised in the end of “At World’s End,” Jack’s looking for the Fountain of Youth if for nothing more than ships and giggles. First, however, he must take a side trip to London to rescue his old pal Gibbs (Kevin McNally) and subsequently the palace of King George (Richard Griffiths in a lovely cameo). There, he learns that his old pal Barbossa (Rush) has lost The Black Pearl as well as his leg and sold out to His Majesty’s Royal Navy. He is to help the English find the Fountain before the Spaniards do. Jack, of course, knows the way there, thus continuing his ongoing role as an indispensable pestilence. After a familiar improvised escape, he crosses paths with an old lover, Angelica (Penelope Cruz), who he once deflowered before she was to take her vows at a convent. She mentions she has a ship he can borrow, only it turns out that it’s her father’s ship, the Queen Anne’s Revenge, captained by none other than Blackbeard the Pirate (Ian McShane), a feared and soulless scourge with a minor in black magic. So much for smooth sailing. As overdone and cliché as the Fountain of Youth may be, it’s perfect for the “Pirates” franchise and helps keep things very simple, something the last installment had more than a fair deal of trouble with. Only a few character subplots threaten to convolute the story, but all motivations lead to the Fountain regardless the reason. In fact, “On Stranger Tides” marks the first film to truly focus on Captain Jack. With Orlando Bloom and Keira Knightley’s characters out of the way, the franchise can keep the spotlight on the reason it’s gotten four films deep. Depp has nothing new in store for us as the true center of attention, but by continuing to underplay the trademark quirks and mannerisms, he continues to prolong the deterioration of the Capt. Jack act. Some might disagree, but it depends how much you liked him the first place. 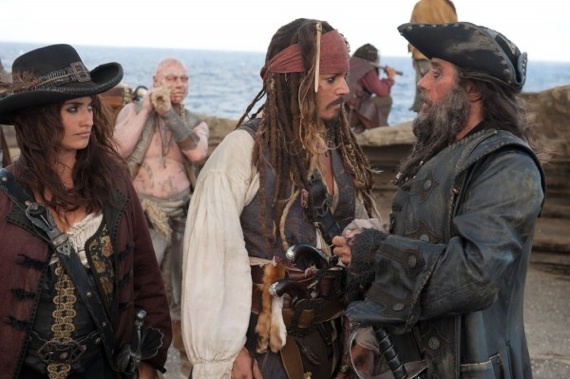 In terms of new faces, Ian McShane is impeccable as Blackbeard. Rush gave a wonderfully theatrical performance as the main villain in the first film, but McShane introduces the first true quantifiable force of evil the franchise has seen. Although his voodoo abilities and reputation for killing his men and bringing them back from the dead to serve as his zombie slaves are never entirely realized, he’s the merciless villain this film needed. He never fully crosses into scare-your-children evil, but he could’ve at any instant and that feeling radiates from his performance. In general, this film aligns itself more with fantasy and traditional folklore than the supernatural like the previous film. Among other new faces, Rob Marshall as the franchise’s new director does serviceable work. The “Chicago” filmmaker chews the scenery well and creates effective moods and tones, but the action could have been a bit more inspired, especially considering the series’ reputation for sword-fighting ingenuity. Not much else deviates from the formula, so those hoping for a resurgence in the series or something as good as the first film, “The Curse of the Black Pearl,” will remain wishful thinkers once again. It’s hard to imagine where the series could go next without retreading over old ground or just introducing new characters for the sake of it, but Captain Jack Sparrow remains one of the few reliable comforts of blockbuster cinema, and any adventure with him at the wheel will struggle to be a total waste of time. “On Stranger Tides” makes just enough adjustments to the series to make for a successful installment.